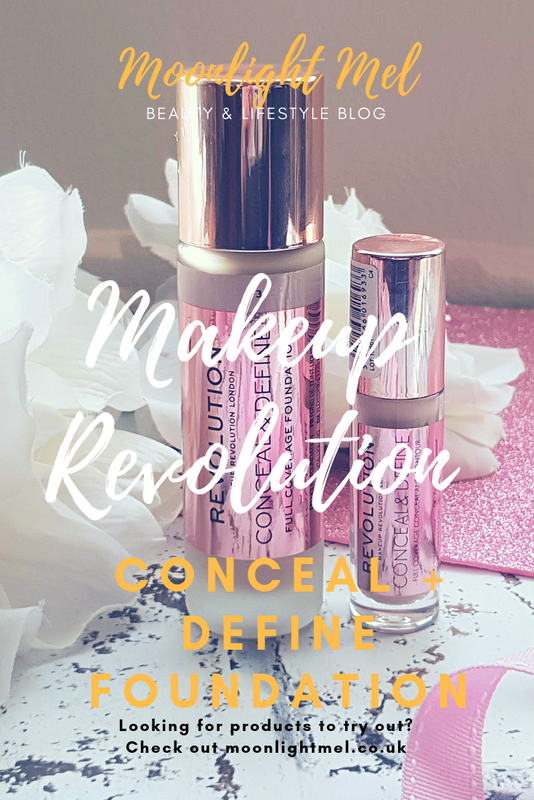 Now we all know how hyped everyone was with the Makeup Revolution Conceal and Define concealer and still are and rightfully so! So when I heard that they were releasing a foundation version I thought OMG I just have to have it so I can compare it to the concealer. 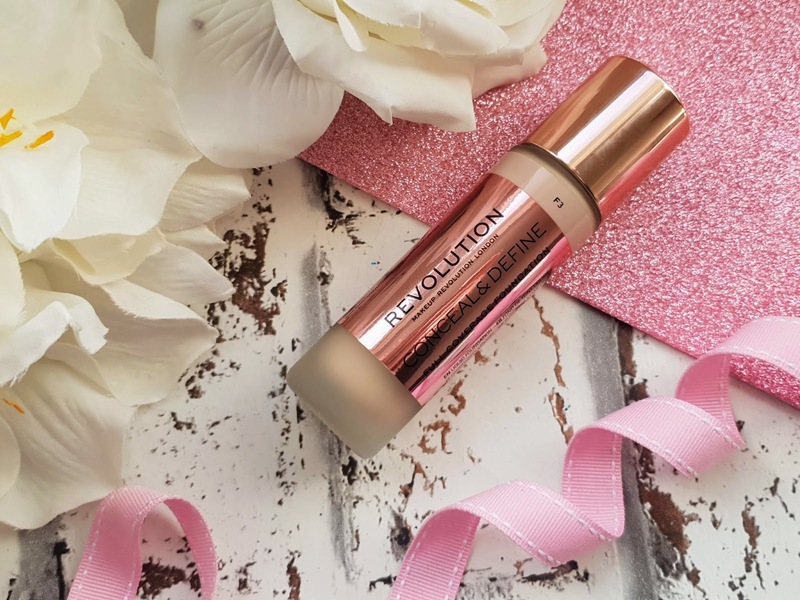 The Makeup Revolution Conceal and Define foundation comes in 24 skin-true shades and can be used on every skin type and tone. Its formula is described as lightweight yet it can be buildable. It has a demi-matte finish and its oil free with a creamy formulation for comfortable wear without being dry or creating line/wrinkles, even with long-wear. As soon as they announced its release I actually went to my local Superdrug store the next day excited to buy it but me being over dramatic was disappointed as it wasn't in yet... I then realised when I got home it was only realised online and not in store yet so I had to wait another week until I got my hands on it haha. So yeah I basically I got it as soon as my local Superdrug had it the following week. The packaging for this foundation is a just sheer luxury! It comes in a luxe glass bottle with a rose gold label and lid. Just like the concealer, it has a doe foot applicator wand but its way larger than the concealer, just like you would expect anyway. Just like most drugstore foundations it comes as it is without a box but who needs one right when the bottle looks this nice anyways right? Since the bottle isn't made of plastic like concealer, it actually feels better quality especially as it is like a frosted glass bottle it just gives it an edge. It feels rather heavy too and actually feels heavier than any of my other foundations even my more expensive ones including my Kat Von D Lock-it foundation. Now you would think that since it feels heavier you would have the same or even if we are a little bit lucky maybe more product but no you would be wrong... it contains 23ml of product compared to most foundations I have ever used which contains 30ml ( including drugstore bought foundations!) Now since the concealer was amazing but only contained 4ml of product, I was pretty confident the foundation would follow suit with a bit of luck. Application with this is hmm... how can I put it? I am not sure about it to put it in simple terms. It has a doe foot applicator which is a larger version of the concealer and you put it either on your face or on a damp makeup sponge. 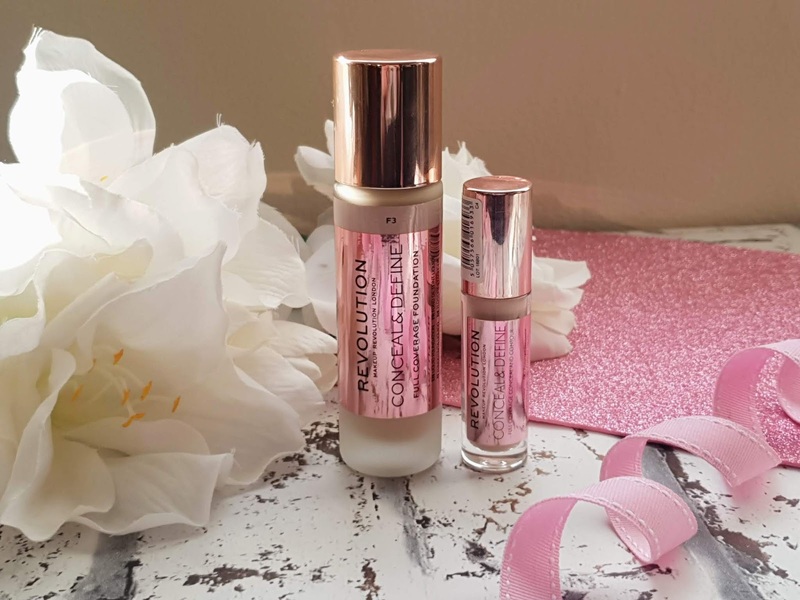 For me personally, I much prefer using a pump action liquid foundation rather than an applicator as it's easier for me to get the right amount each time. With this, it took a bit longer and I need to put the applicator in the foundation a few times to get the amount of product I needed. I put this foundation on as soon as I put on my primer and I usually go for Illamasqua hydra veil or my pore refining primer from Loreal. 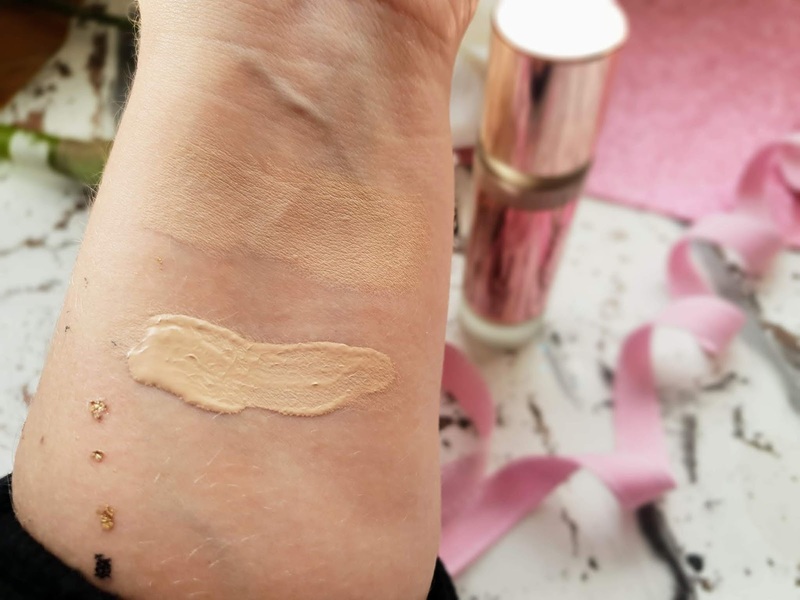 The foundation itself has a full coverage pretty much straight away and but it does take a little bit of time to blend completely seeing as its a thick full coverage foundation. I got the shade F3 and it matched my skin tone perfecly and also went well with my C4 concealer. 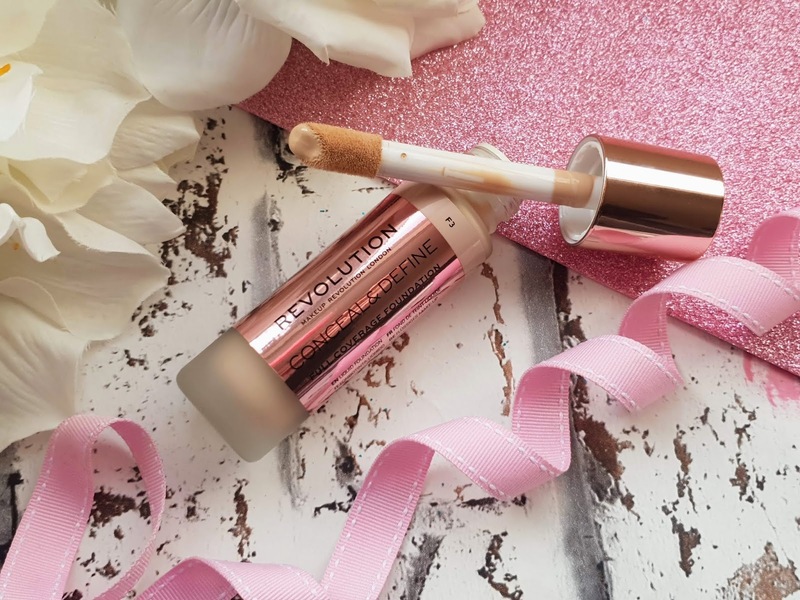 Makeup Revolution Conceal and Define foundation is wonderful for a few hours of wear and looks flawless at first but after that, it starts to dry and flake in areas and before you ask, yes I have tried it with different primers and also used a makeup powder and setting spray. I just feel a bit defeated with this foundation as for me it just doesn't last as long as I would like and it looks dry in areas after a certain period of time. Now I am not sure if that's because my skin is a combination because it happens to the areas of my face which are dry. It has some amazing points seeing as its long lasting, 24 shades to choose from and also coming in a fabulous packaging. It also is cruelty-free, vegan-friendly, paraben free and oil free. Overall I would say its an ok foundation but I really can't see it replacing my current favourite drugstore foundation which is the Loreal Infallible foundation ( I will do a post on why I love it in a few days time). Its fine but I really don't like how dry it makes some parts of my skin and also I am not a huge fan of the doe foot applicator. I will use it until it is gone, however. I do love how many shades they have and my goodness haven't makeup revolution done amazing at realeasing so many amazing products in short periods of time! 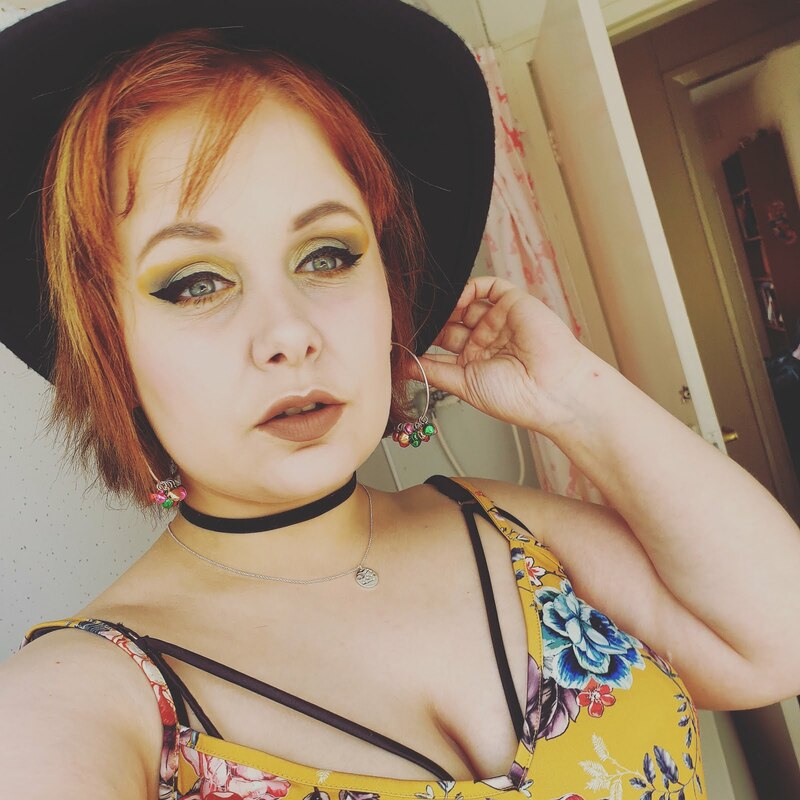 I love the brands but this foundation just isn't for me, which is a shame. I have just purchased this foundation but am still yet to test it out, it's a shame this didn't work for you! I've had mixed reviews on this foundation, and I loved the concealer but I think for now I'll stick with my current one! I love that they have so many shades but I wish it was a bit longer lasting. In the heat where I live most foundations melt off unless they are super long lasting. Shame it doesn't quite work for you, but at least it was cheap! I still need to try the concealer, it's always sold out near me.